In short, it is perfect. I truly is a functional piece of art. I went over every stitch and could not find a bad one. My old belt seems like a shoelace compared to the rigidity of this one. It is everything I had hoped it would be. Thank you for the excellent product and excellent customer service. Read the Concealed Nation Lenwood belt and holster review. Read the GunsumerReports review of the Lenwood Hybrid belt and Specter holster. I just want to follow up with my holster order and the belt you included. The belt is solid, bar none best I’ve ever seen. Wear it for EDC off duty. The holster is also my go to for off duty appendix carry. This is a quality constructed super sturdy belt. I bought this for everyday use, usually with a Milt Sparks IWB and 3″ 1911. It’s stiff enough to ride comfortably without sagging, and looks quite nice. It’s exactly what I think a gun belt should be. Recently got my hands on two Lenwood Leather Hybrid Gun Belts, one in brown and one in black. Here are my impressions both pro and con… well, the cons tend to be more of a cosmetic nature and nothing that interferes with functionality or, really, appearance to be honest so let me get back to that later. The pro’s are numerous. The Lenwood Leather Hybrid Gun Belts are constructed of a two-ply construction comprising more than 1/8 of an inch leather backed by PVC coated webbing of almost equal thickness. The belts are extremely handsome and well suited for wear in even Business Casual settings. The only untoward note would be the heavy (by necessity) chromed buckles which are secured by sturdy Chicago screws. The only upgrade I could think of, from an aesthetic standpoint, would be to order a buckle upgrade kit (matching buckles and Chicago screws set) from the Lenwood Leather website (http://www.lenwoodleather.com/). The upgrade sets come in Stainless Steel, Brass Plated steel, Blacked Out, and Chromed. From a personal standpoint I intend to get the the brass coated set for my black belt and the “blacked out” set for the brown holster. As for construction of the belts themselves… many of the current crop of high end gun belts currently on the market “sandwich” a “stiffener” strip between two layers of either webbing or leather in order to add vertical rigidity to their belts. However, the Lenwood Leather Hybrid belts do not contain a stiffener strip and they don’t need one. The vertical rigidity of the Hybrid belts is more than adequate and, due to the PVC coated webbing backing, should remain so for the life of the belt. Many of the testers attempted to squeeze the edges of the belts with their fingers and none of them were able to get more than a slight flex in the vertical plane of the belts. This is more than adequate to support the type of equipment a personal gun belt should be expected to carry. During testing the Hybrid belts were able to consistently carry more equipment than most of the law enforcement duty belts we had available for comparison. One worry we had was that the two materials would separate at the edges under strain. Our worry was needless. The edge mating of the two materials is exceptional and at no time during any of the tests performed did the two materials show any signs of separation. The stitching on the belt is even and very well done. The PVC coated webbing is of a type that appears to have a “stitching groove” molded into it along both edges and the stitching groove along the edges of the belt precisely match those on the PVC coated webbing portion. As a result the stitching is situated so that the threading runs in grooves along both sides and is thus somewhat protected from wear. The stitching itself runs the length of the belt even out through the length of the tongue. The dying for both belts (black and brown) is even, handsome, and deep. Even better, the colors are almost exact matches to those produced by Kiwi for brown and black shoe polishes. As a result, even deliberate attempts to scuff the leather portion during tests showed little damage that couldn’t be corrected by the application of minute amounts of Kiwi shoe polish using a cotton swab (Q-Tip). Within minutes there was no sign of any damage. One of the worries that attends both belts constructed of leather and those constructed of synthetic materials is stretch. After looping the belt over a steel pipe a 250lb man supported himself by standing in the belt for almost 30minutes. When measurements were taken prior to the test were compared with measurements taken after there was no sign of stretching. It should also be noted that, unlike the Conveyor belt, the Hybrid belts are extremely easy to thread through belt loops while still remaining “grippy”. Now, admittedly, the Hybrid belts are less grippy than the Conveyor belts but that should not be taken to imply that they aren’t grippy at all. The PVC coated webbing backing tends to “conform” around clips and belt loops which provides for more than adequate “grip” to keep holsters and equipment pouches (such as magazine pouches) in place. The only time we were not able to get any significant traction were when we attempted the tests using holsters and pouches which used cloth or webbing belt loops. Leather, metal, and hard polymer belt loops and clips were easily retained in place with only minimal shifting while still remaining easily repositionable by the wearer. So, in summary, the pro’s are handsome appearance, easy maintenance, durable, and highly suited for service as a gun belt for both concealed carriers (IWB and OWB holsters and mag pouches) and law enforcement. And, surprisingly after my experiences with MUCH more expensive belts, very comfortable to wear regardless of the holster type you choose! Now in case you are wondering… I tend to “collect” gun belts with the majority of the ones I’ve picked up in the last couple of years having the internal stiffener inserts. Three belts in the $150 range and five belts in the $100 range but synthetic materials such as reinforced webbing up through leather and the Hybrid belt comes in right up in the top of that list for vertical rigidity (ie.. support for holsters with BIG guns… it handled my Desert Eagle with no problem) and also right up at the top of that list for workmanship and comfort… something you WILL appreciate after a 8-12hr day of lugging a full-sized hi-cap 1911 with 2 extra clips, a taclite, and a set of cuffs around. And to top it all off the belt runs nearly 50% LESS than what I paid for my current two favorite gun belts. This is a solid deal that you just can’t beat and the prices can’t last long at the level of demand these belts are going to generate. Now, to the con’s… I must stress again that these are purely cosmetic in nature and do not impact the capabilities of the belt OR the appearance of the belt to others while the belt is being worn. The inside PVC coated webbing material has to be, by necessity, heat “sealed” after being cut. It is evident that the sturdiness of the material prevents that from being an easy operation and the end results of the sealing process are easily visible… on the INNER surface of the material/belt. The other cosmetic “down tick” was the result of an obvious attempt to “brand” the Lenwood Leather label into the interior PVC coated surface. The Hybrid belts are a relatively new product and I received two very early belts to test… on the belts I received apparently the “brand” was too hot which resulted in a slightly “smeared” look and an label that couldn’t be read. Neither of these two points affect the outward appearance or the functional capability of these belts as both “blemishes” are on the inner surface of the belt. 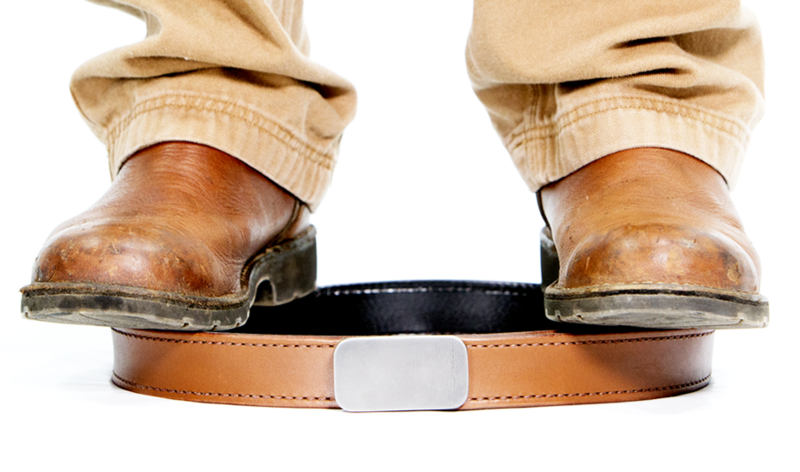 If you follow those sizing instructions you are going to love this belt. I use a bravo concealment OWB holster with a sig p229,this gun is a brick and a standard belt sags,but this belt works great,its stiff but the more you use it the more supple it gets without sagging. These belts are very stiff and sturdy. Possibly bulky for every day dress if you need to dress up, which I do, but it works as promised. Never slips and distributes the weight beautifully. The buckle is a little big for dress wear, but the belt works. I bought the Hybrid version . . . wow, I didn’t think a “bulky, heavy duty” belt would be so comfortable! You don’t have to cinch this belt up to hold your CCW and pants – it supports itself AND your stuff, simply amazing! This is one impressive belt! I’ve got several Lenwood Leather products, but this is one of my favorites. I carry a Glock 19 IWB every day and the belt has zero roll or sag. Plus, its stiff enough to hold my carry rig, but it doesn’t feel like I’m wearing a duty belt. The fit and finish of this belt is top-notch (par for the course in my experience). Even though I don’t think I’ll ever want to, the ability to swap out the buckle is a nice touch. Overall, this is a fantastic belt that will probably outlast me. C R Stevens said it all. Used it with a Blackhawk in a field holster while deer hunting in the Catskills yesterday, and it’s the “CATS MEOW”! For years, I’ve been trying to find a belt, that wouldn’t slide, or sag with a heavy revolver. Now I got one! As far as picking up lint, and messing up my clothes, I bought it for the outdoors, not a fashion show. I have a few fellow hunters that also showed interest in it. As stated in the other reviews, it seems to be rigid and a good value. BUT, once you get it on and cinched up, IT WILL NOT MOVE. This thing is built like a proverbial outhouse… tough doesn’t even begin to describe it. It is a stiff length of what feels like fan belt material (I once made a belt out of an old potato conveyor webbing and it’s comparable). The downside is it’s roughness and thickness for taking on and off, especially if you have accessories on the belt. If you have the patience to deal with that, it will serve you well. It doesn’t move and NOTHING moves that you attach to it. I took it to a belt sander and narrowed it a bit, rounded the edges, and smoothed the face of the belt and it’s (barely) livable now. The support it gives is incredible, both to your load out and waistline. First, I recommend that anyone ordering this belt allow +2″ for how stiffness/rigidity and another +4″ if you intend to carry IWB with that particular belt since when I carry IWB I am not only carrying a handgun but also an IWB double mag pouch. As a result I wind up having to punch at least two more holes into most of my belts so I can cinch it up enough when I am not carrying IWB. Stability – The material is really “grippy”. With the belt properly cinched not one OWB holster, no matter what we tried, shifted position except for the ones with Kydex or rigid synthetic belt loops. The same thing applied to IWB holster. We even tried walking into door frames and stuff while wearing OWB holsters so that we didn’t just “brush” the holster we let it smack head on into vertical surfaces. In at least one instance the holster gave way before the belt did. The belt loops on the holster popped the seam at the bottom of the belt loop from the force and the belt actually held the rest of the holster in place. Even a broken holster and jumping jacks didn’t shift the holster. Quality – Really well made, despite the material there were no threads or “fringe” on any of the cut edges or cinch holes. Considering the material everyone was really impressed. Vertical Rigidity – Everyone was REALLY impressed with the vertical rigidity of the belt. I even tried a fully loaded Desert Eagle .44 Magnum handgun, in a hip holster, with a double magazine pouch with two loaded magazines, my favorite multi-tool, my favorite EDC flashlight, and a Cold Steel Leatherneck Tanto… all hanging off of the right side of the belt. The belt didn’t curl… even after a few jumping jacks and squat thrusts… but by the time we quit trying it felt like the blasted thing was about to start cutting me in half. Hardware – Really nice hardware and nicely done on attaching it to the belt. Getting that material to fold over that sharply must have been… challenging. Price – This is a really solid belt for the price. It may just be the least expensive gun belt I have by over $40 and it outperforms most of my belts that cost over three times what I paid for yours. The only belts I have that come close ran me over $100. The Material is..REALLY.. Grippy – The belt is almost too “grippy”. The surface is so rough and “clingy” that we had a hard time threading it through the belt loops on our pants and getting holsters, sheathes, and other gear threaded onto the belt took a bit of patience. However, while it can be frustrating as far as we can tell nothing and I mean nothing is going to shift unless the wearer deliberately moves it. Appearance – No offense but while the belt is hideous it is definitely not an office belt. It’s perfect for running around on your own time or when you are out in the field but even if you wear jeans to work and your boss is more into the casual part of “business casual” I wouldn’t wear this belt to work. Just something that probably needs to be stressed if it ever comes up. Dirt Magnet – because the surface of the belt is so rough it was difficult to get dirt out of it. Just threading it through everyone’s belt loops picked up “lint” from the belt loops. In order to get the debris off of the surface of the belt required a nylon brush and a lot of water in the sink. The mud and dirt came off pretty easily, the “lint” took a little more work. Well, that’s pretty much it. For a casual or “trail” belt this one is a winner and the price is fantastic. The only con’s we could find are also the result of what we considered a Pro… how grippy the surface of the material is. In everyone’s opinion the level of the Pro (how well it kept the gear from shifting around) pretty much outweighed the Cons. This belt is well built and is a quality item. I use this belt to conceal carry a Sig P220 and the belt supports the IWB holster very well and is a very comfortable belt to carry with. I use this belt to carry whatever gun I choose or anything else that can be worn on a belt. It is very sturdy and well made. The quality of the leather and workmanship is top notch, a very good buy for the modest price. It is the best belt I own. This is the best Belt I have ever owned. Its just right for any holster, double thick and really top knotch workmanship. Stitching is perfect. This Belt will last me the rest of my life. Very sturdy belt, holds my holster and mag pouches solid. I wear my belt fairly tight and after the break in period, which did take a little while, the all leather belt conformed to me and is very comfortable. I have a belt (different brand) with a liner that remains uncomfotable. It runs true to size. I suggest measuring a belt that you currently wear, don’t look at what size that belt says (I made that mistake, Midway made the exchange process easy) and that measurement will put you in the middle hole of this belt. I have worn this belt every day for the last two years and it still seems like it is brand new. The way to tell that I have used it at all is that there are some scratches where i buckle the belt and where my holster clips on. After two years the belt is still extremely sturdy it shows no signs of folding over or problems holding up my holster. Also i have had no problems with the two layers separating. As far as i can tell this may be the last belt i will ever need, but if i ever have to by another belt i will buy a Lenwood belt. I would also recommend this belt to anyone who wants a good sturdy leather belt that should last you for years if not longer. I use this to hold up my pants and for holsters for tools and firearms. The leather is smooth inside and out and I like that. This belt may out last me. I usually don’t leave comments / reviews of equipment. But seeing as this piece of gear ties in my concealed rig so well I felt I had to express my graduate. I used to get fussy and irritated when carrying and being with my wife shopping or getting groceries because of the flimsy and weak bekt I was wearing did not support my Glock 19 in a way that wouldn’t result in the gun shifting, moving and sagging. With this Hybrid belt on NOTHING moves! I’m so glad to hear you are happy with your Lenwood Hybrid Belt! Stay safe out there and let me know if there is anything I can do for you in the future. I just wanted to say how much I love my gun belt I picked up at a gun show in Kc last year. Truly my go to belt for every outfit. The double thick one piece of leather provides a sturdy support for my .45! I received a Blunt Force Trauma (BFT) Belt in October 2016. Shipping was very quick, (Thank you) and the belt was incredible quality. I wanted to wear the belt for a period of time before reviewing, so, that brings us to May 2017, or, 7 months later. As a comparison, I have MANY other belts which ALL are quality brand names. Some name brand belts were great and others were very disappointing, however, the LENWOOD BFT is right on top. It is constructed of amazing Quality and of such that after 7 months, there is no wear noted and am sure it will stand up to not only many, many years of use, but made such that it would withstand any type of abuse you could throw at it, it is a 100% “perfect” belt. The absolutely only minus I could even imagine anyone saying would be the weight of prolonged wear, however, isn’t this why we originally chose the BFT Belt to begin with? I would not hesitate to recommend or purchase any of the LENWOOD products. The quality of the product is great!! There can be times that you may possibly need service and others out there do not come close to the personalized after sale customer support of LENWOOD. After 7 months of use, not only has the belt stood up, but the AFTER Sale service and support is definitely on top of anyone out there. I am amazed that a company still exists that is Honorable, Trustworthy, Truthful and Respects the end user (the customer) in this day and time of “The Almighty Dollar” being the be all and end all of “most” businesses, I can honestly say that LENWOOD, to be by far the best company out there and wish they sold everything I used as I would buy everything from them. LENWOOD is the definition of High Quality, Fair Price and Personalized (before and after sale) Service. You can not ask for more than that and LENWOOD has a customer for life and will recommend their products to anyone that asks (and to some that don’t ask 🙂 THANK YOU!!! My Wraith just arrived for my S&W Shield. Precise fit and excellent workmanship. All pros and no cons from me. Lenwood creates some of the best holsters and belts money can buy. The workmanship, quality, and customer support is unsurpassed. I have bought SOO many holsters in the past that have disappointed me in one way or another. I now own several holsters and a belt from Lenwood and couldn’t be happier with all of their products. If you haven’t tried their product yet you need to. You will not be disappointed. The Blunt Force Trauma belt is a real piece of quality craftsmanship. The materials are top notch and the fit and finish are outstanding. The stitching is perfect, the fit of the buckle is great, there is nothing that was done cheaply nor any corners cut. The difference that the belt made when carrying was unbelievable. With a pretty stiff webbing belt I thought my setup was pretty comfortable. My CC is a LC9s, so it’s a pretty light gun, and I have a high quality holster that is comfortable for all day wear. But I didn’t realize how uncomfortable it was until I clipped into this belt. The belt now holds the gun in place, what I now understand is I was tightening my old belt so the holster and gun were being held in place because they were pressed up tight to my body. Now I have my new BFT belt at a much more comfortable tightness and the gun still stays firmly in place. There is no doubt that this belt will last many many years. It was expensive, but still cheaper than a pair of shoes, and I wear those every day too. I just wish my shoes would last as long as this belt will. Also worth mentioning is the service. I have had to contact Lenwood because I ordered the wrong size. Jason responded quickly and got my replacement out fast. It was nice working with a real person, and I got the sense that he actually cared about my satisfaction.